0 Comments Published by KL Ocs Kid on Tuesday, October 30, 2007 at 10:14 AM. Cardiff City manager Dave Jones says Robbie Fowler is only thinking about trying to beat Liverpool on Wednesday when he returns to his former club. The striker is sure to get a rousing reception when he returns to Anfield for the fourth-round Carling Cup tie. "He'll be totally focussed on playing and you can grasp that by him not wanting to do interviews," Jones said. "To go back is special, but all he wants to do is get his head down and put on a performance for Cardiff." Reds fans still fondly call Fowler by his nickname 'God', even though the 32-year-old first departed almost six years ago, sold to Leeds in November 2001. "He's had an unbelievable career at that football club [Liverpool], brought up locally and had fantastic achievements," Jones added. "It's good for him going back with all his family and friends, but he's been back many times with Leeds and Manchester City. How will Cardiff fare at Liverpool? "But basically he's a professional footballer and he just wants to do well. "All the hype that goes on is for the supporters and the press." 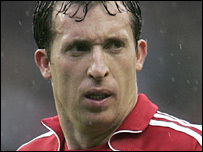 Rafa Benitez was the Liverpool manager who brought Fowler back from Manchester City in January 2006, only to release the player six months later. While the Spaniard says Fowler could no longer perform at the top of the Premier League, Benitez still regards the Toxteth-born player as a real threat. "Robbie is a player with fantastic movement," Benitez said. "He didn't have the legs you need in a top side, but he had everything else - the passion, the commitment, the mentality and the character. "I don't want to see him scoring goals in this game. I want to see him before the game very happy and after it a little bit disappointed - and then scoring 20 goals and being the top scorer in the [Championship] league." Cardiff City's biggest injury concern for Wednesday is defender Kevin McNaughton. The Scotland international has a stomach strain and was being monitored on Monday. The Bluebirds also have concerns over Roger Johnson, Trevor Sinclair and Paul Parry. Loan goalkeeper Kasper Schmeichel is not being allowed to play by his club Manchester City who do not want him cup-tied, so Michael Oakes will return to the starting line-up. Goalkeeper David Ford was cup-tied when on loan at Luton Town, so the Bluebirds will have youngster Josh Magennis on the bench.